There are some achievements that every knitter remembers: their first project, first shawl, first sweater. . .and their first pair of socks. When you feel the call, this kit contains everything you need for your first pair of socks. Be sure to check out our full class videos for both Toe Up and Top Down versions. 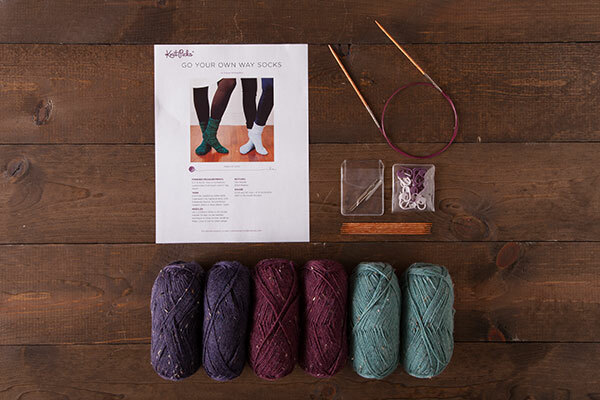 Note: This kit provides the tools to knit socks using both Magic Loop or DPN methods. You'll also have enough yarn to make 3 pairs of socks! 6 full-sized balls of Stroll Tweed Sock Yarn (2 each of Indigo Heather, Barn Door Heather, and Thirst Heather). This is not actually a review - just a response to some of the other reviews. There is only one circ needle because they are giving you the option to knit the socks using the magic loop method, not the 2 circ method. I really enjoy using KnitPicks yarns and tools. However in this kit I wondered why I received only one circular needle when two are required for the project. Not a review....just a note. I gave this an excellent rating because KP items are awesome!! I knit my socks on 2 circular needles....so I would think there would be 2 circs in the kit.